1) Slip the ring around your anchor line and fasten the ring ends into the cliphook which is attached to the rope and buoy. 2) Drop the ANCHOR MASTER™ into the water and motor towards the anchor. 3) Run past the anchor at the speed of 6-8 knots. The buoy will mostly submerge until the buoyancy of the buoy raises the anchor. 4) When the anchor is fully raised into the ring, the buoy will pop to the surface. The ring will hold the anchor at the surface. 5) Slowly return to the buoy while you are retrieving the loose rope. 6) Carefully lift the buoy and anchor into your boat. The Anchor Master was the first complete buoy & ring anchor retriever system offered nationally to the boating consumer. It is still the standard that all copies are measured against with superior quality and U.S. manufactured components. 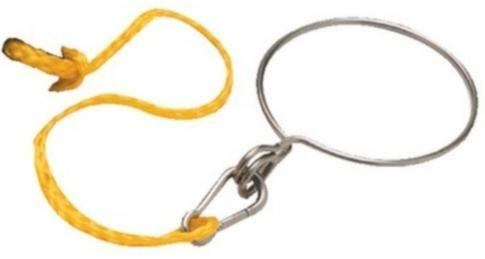 The Anchor Master allows a boater to easily and safely retrieve the anchor. This product eliminates all the hard work pulling up an anchor and all the pain to the back and hands from doing that work. It also eliminates the danger of falling overboard while pulling that heavy load. The Anchor Master was the first complete and ready to use anchor retriever system on the market! Furthermore, it uses the most foolproof method of retrieving your anchor - no springs to malfunction, no plastic parts to break, no device to feed your anchor line through. The Anchor Master utilizes all stainless steel hardware for a durable, non-corrosive system.